Daughters of the Nile is an international fraternal organization for women 18 years of age or older, who are related by birth or marriage to a Shriner, Master Mason, or Daughter of the Nile. 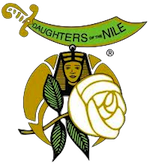 Founded in 1913 in Seattle, Washington, Daughters of the Nile now totals over 32,000 members in 144 cities throughout the United States and Canada. The members of Daughters of the Nile are proud of their long association with the Shriners International and their continuing support of the Shriners Hospitals for Children. Daughters of the Nile contribute over $1,000,000 annually to the Shriners Hospitals for Children® to be used for the medical care and rehabilitation of children. Since 1924, Daughters of the Nile has contributed monetary gifts amounting to over $46.9 million. Daughters of the Nile is local to Winnipeg and is one of many subordinate temples within The Supreme Temple Daughters of the Nile. Our membership is 300 strong and we average 100 ladies in attendance at each of our monthly meetings. Monthly meetings are held on the 2nd Monday of each month except for June, July and August. Meetings are held at the Khartum Shrine Centre, 1155 Wilkes Avenue,Winnipeg and commence at 7:30 p.m.
For more information, visit our website at www.sphinxtemple116.ca or email recorder@sphinxtemple116.ca.